Lightweight Aluminum DOT and TC certified cylinders ?Made in the USA? A perfect tank for any paintball marker that operates on High Pressure Air. 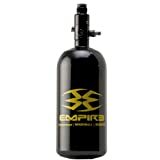 This Empire Paintball 47cu/3000 PSI tank is Made In The USA.